After you have defined the Enterprise Message Bank, see “Configuring the Enterprise Message Bank”’ in Configuring Productions. ^IRIS.Temp.Ens.EntMonitorStatus by polling namespaces from Systems List every CallInterval seconds"
Ens.Enterprise.MsgBank.TCPService  Accepts inbound data from the client productions. For details on configuring this service, see “Configuring the Message Bank Service on the Server” in Configuring Productions. 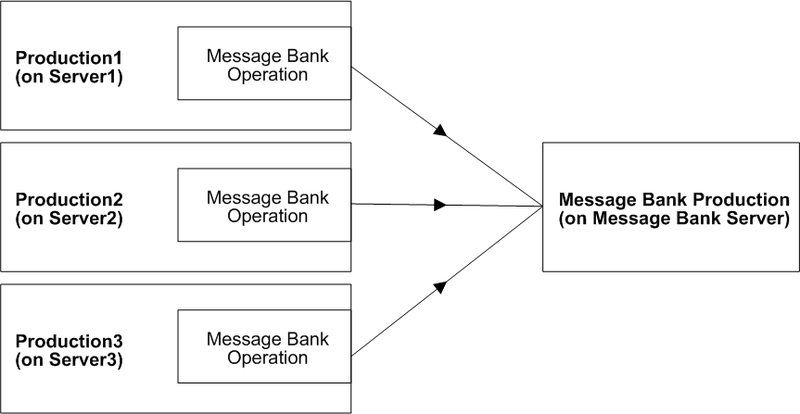 The Message Bank has no synchronization dependencies for message body classes with the contributing productions; therefore, it receives a serialized form of each message. For virtual document message bodies it reparses the serialized document into an object, and receives and stores the search table entries from the contributing production as well. To enable searching by custom schema properties in the Message Bank, make sure to place the custom schema definition in the Message Bank production namespace. The Message Bank page also serves as a portal for viewing the state of multiple client productions and for invoking a resend service on them. For these extra features to work, the Message Bank needs to know the web addresses of the client productions. For details, see “Configuring the Enterprise Message Bank”’ in Configuring Productions. It is possible to replay messages from the Message Bank back into the originating production or another client production. See “Using the Enterprise Message Bank”’ in Monitoring Productions.